Size: S/M This item is currently out of stock. 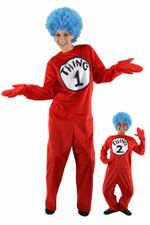 What's more fun that being Thing 1? 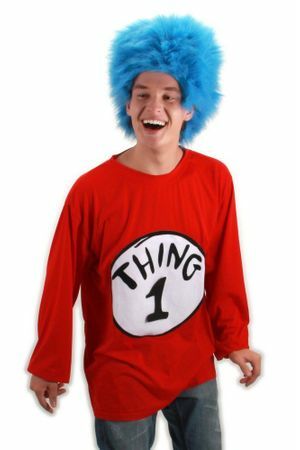 This easy unisex adult costume includes long-sleeved red tee shirt with screen-printed white circle with the words Thing 1, and a wild, furry blue wig. Officially licensed by Dr. Seuss Enterprises. By Elope. 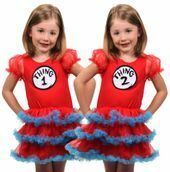 Pair with our Thing 2 T-Shirt Costume for a matching couple costume! 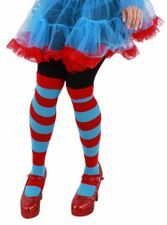 Great for Halloween or Dr. Seuss's birthday! 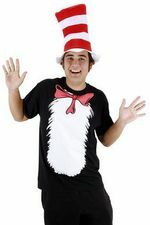 See more options in our Dr. Seuss Costumes section!